Anyway lets cut to it! Morning sun through the trees. 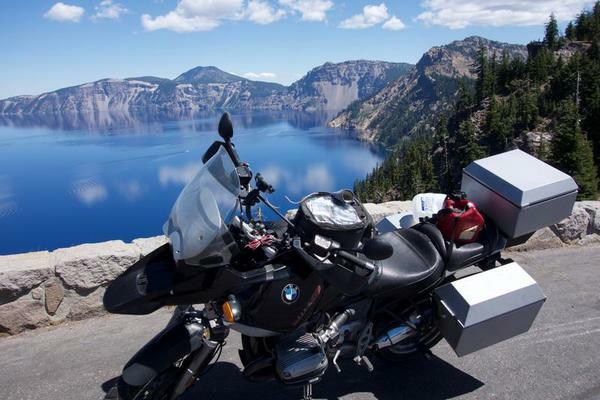 The motorcycle over Crater Lake. The look at the top! So after a long day of adventuring and taking pictures I had to find some place to rest. There are two campgrounds in Crater Lake National Park, one by the south entrance and the other is located near the Pinnacles. It turns out, even during the week, that these campgrounds are packed with travelers. 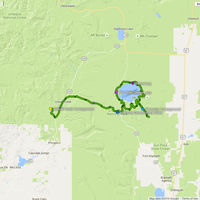 These folks got to crater lake via many different means including hiking, biking, motorcycling (👍), car’ing, and rv’ing. 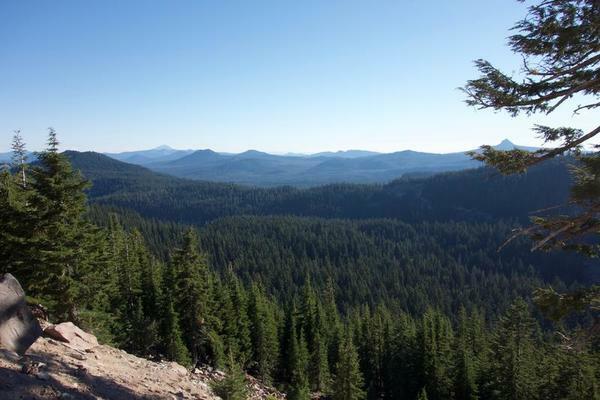 I was most impressed by the folks who had hiked in along the Pacific Crest Trail (PCT). That takes some serious 💨. Rode around the camp site at the Pinnacles only to find every spot was taken. I had nearly given up when an older gentleman waved me over and offered a spot to place my tent. His name was Harold and boy did he have some interesting stories to tell. He was a hiking fanatic and, despite his age (he’s has to be in his 70’s or 80’s), he was planning on hiking the PCT with a buddy of his. 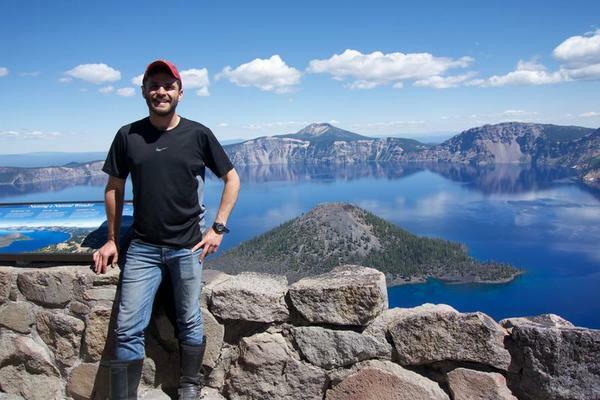 His car was loaded down with dehydrated meals and supplies for the trip as he expected to play leap frog from one trail head to another with the assistance of his friend. He was heating up dinner at the time and was kind enough to share it with me. It was some pasta sauce that his wife had made for him before he left. I added a little salt but otherwise it was pretty darn tasty for something that was completely dehydrated! We talked about his other hiking adventures through the Adirondacks. How west coast hiking is a cinch compared to east coast. Good tips for the future! After I got settled I made my rounds throughout camp, something that I wouldn’t have done previously. I met some kids who were building trails for the summer with the help and guidance of their chaperone, of which was from Oakland! I also met Liz and her dog Abby. I literally made some comment about her dog and we ended up talking for a good portion of the night. Turns out, Liz had just lost her job and was on a bit of an adventure since she had the time and the money. We talked about her mad off-roading skills with her Volkswagon Hatchback and her appreciation for hot springs. It was a refreshing time and was really great to interact with everyone. What’s the main lesson out of all of this? All it takes is one comment or even one look into the eyes of another human being to make a connection. I otherwise would have been on my own that night if it weren’t for Harold, Liz and everyone else that crossed my path that day! 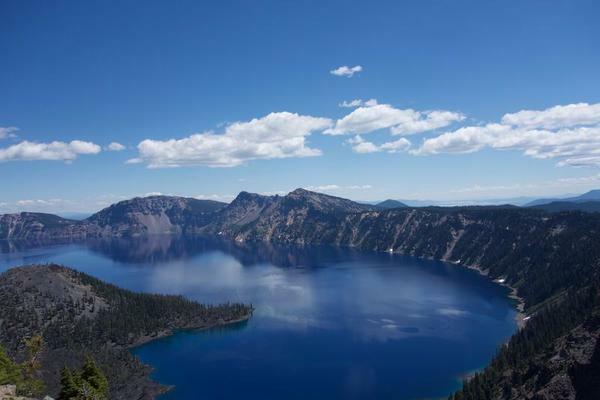 Crater Lake holds trillions of gallons of water. At its deepest point it is ~1940 ft deep. Originally, the lake had no fish but they were introduced ~1900. Only two species still exist today including a breed of salmon and rainbow trout. There are watch towers on the east and west rim. They are only manned during high fire season. When wildfires occur, they are usually let to burn and monitored. 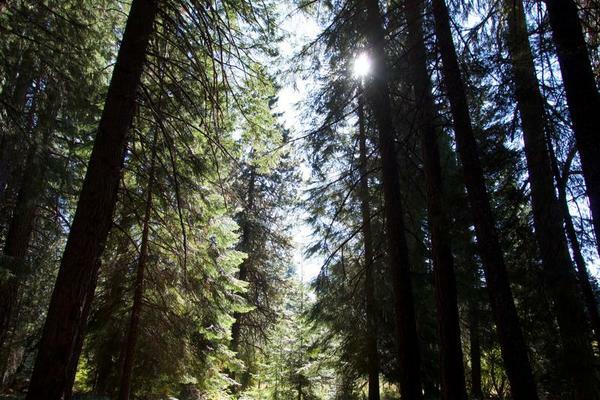 The Forest Service only intervens when the fire may harm people and property. When I was there, they had just reopened the west rim which had been closed for the majority of the summer because of a rather close fire. It is still smoldering today and will continue to until the first rain/snow of fall.